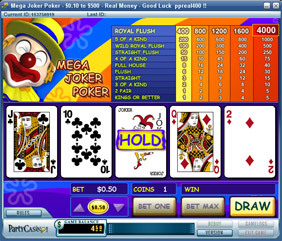 Mega Joker Poker is played against the machine. The objective of the game is to obtain a five-card poker hand containing at least a pair of Kings or better, up to the maximum of a natural Royal Flush. See the ‘paytable’ below for more details. Bets are placed as coins in this game. The value of coins can be changed by clicking on up and down arrows on both sides of the ‘COIN’ symbol. A coin of $1 is set as bet by default when you enter the game. The minimum bet is $0.10 and the maximum bet is $500. The total bet amount is shown in the ‘BET’ box at the bottom of the game screen. The value of coin you are playing is shown on the ‘COIN’ symbol. The minimum coin value is $0.10 and the maximum coin value is $100. The number of coins being played is shown in the ‘COINS’ box; you may play between one and five coins per hand. The number of coins can be increased by clicking on ‘BET ONE’ or by selecting the column in the paytable at the top of the screen. The number of coins being played is also indicated by highlighting the respective column in the paytable. PAYTABLE - The machine pays out as per the paytable shown at the top of the game screen. The prizes shown in the paytable are in coins and each column corresponds to the number of coins bet (one coin to five coins). The total win amount is the number of coins won multiplied by the coin value. The total win amount is shown in the ‘WIN’ box. In the event of your win, the relevant row in the payout table will be highlighted, indicating the hand strength and the coins won. For example should you play two coins at $5 and get a Flush the paytable will highlight the second column and the flush row showing that you have won 12 coins. At $5 a coin you win $60. Your win is based on the combination of the final set of cards, according to the paytable shown at the top of the game screen. Your winnings are shown as dollars and cents in the ‘WIN’ box at the bottom right of the game window. Your game balance is shown at the bottom left of the game screen. See below for more detail on ‘REBUY’. If your game balance falls below the last bet placed, the system will automatically decrease the bet allowing you to continue playing. If your game balance falls below the minimum allowed bet ($0.10), the ‘Buy-in’ window pops up, allowing you to buy in more credits from your PartyAccount. Click on 'RULES' button at the bottom left of the game screen to view the game rules. Click on the ‘GAMELOGS’ button to view the logs of the games you have played. Click on ‘REBUY’ to buy in more credits to the game balance from your PartyAccount. All prizes shown in the paytable are shown in coins. The ‘WIN’ box at the bottom right of the game screen will show all prizes paid in dollars and cents.